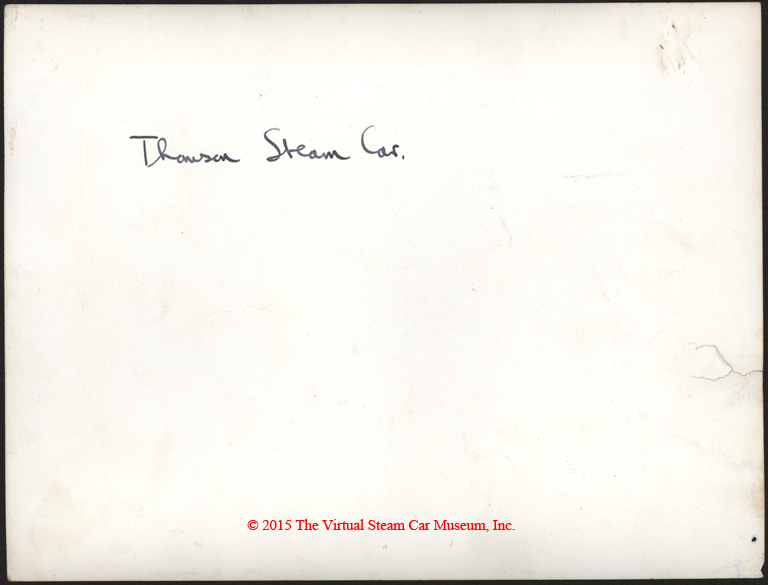 Herbert Thomson is regarded as the first successful manufacturer of motor vehicles in Australia and his initial product, the steam car, produced in 1898 and preserved by the Museum of Victoria, was the first Australian designed and built car to make an interstate journey. This photograph carries identifying information on its reverse. Standing: E. L. Holmes, Thomson's Partner. In the car: Sir Frederick Sargood, H. Thomson, designer (driving), Mr. Sterry, Mr. Sternberg (Vic[toria] Police Commissioner), Mr. George Lansell (extreme right). This image was used in the Australian Motorist on page 19 in the month of July but unknown year. The term "please soften sky" is a note to the publisher to use a white wash on the sky, which is clearly visible on the photograph. 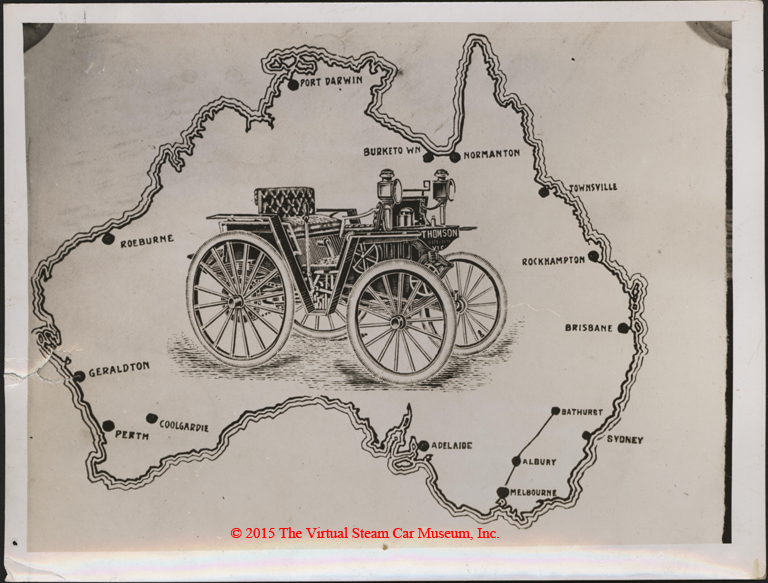 The Thompson Steam Car is show in the center of an Australian map, The lines connecting Bathurst and Melbourne via Albury are apparently its route. 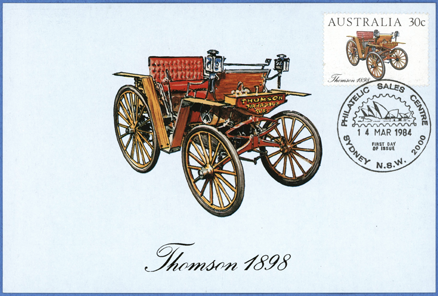 This postcard, produced by the New South Wales Stamp Promotion Council in 1984, carries a short history of the Thomson Steam Car. This particular engine, which is part of the Powerhouse Museum's collection, was produced for inclusion in one of the first, and only, production batch of 12 cars designed and manufactured by the Thomson Motor Car Company Ltd. of Armadale, Victoria. That release capitalised on the publicity generated by their successful display at the Sydney Easter Show and the Bathurst Show and their crowning achievement of the ground breaking interstate trip from Bathurst to Melbourne in 1900. 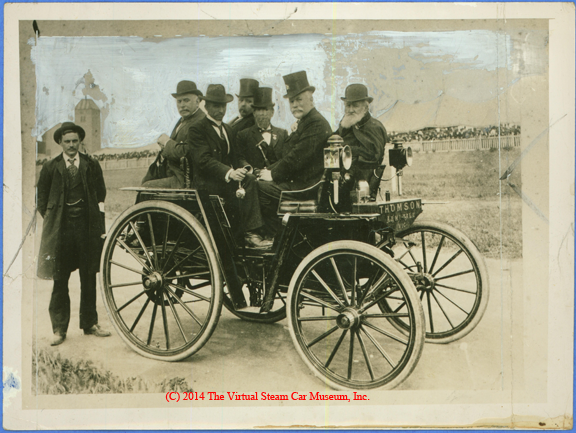 By modern standards the Thomson steam car was very crude and it is arguable that it was an improvement over horse drawn travel. However, the start of the twentieth century seems to have been an era of optimism for mechanised travel and there was an enthusiasm, for some, to participate despite the cost and general unreliability of the vehicles. The local product was quickly surpassed by imported vehicles. Improvements to the internal combustion engines made the steam powered vehicles less desirable as the former became more reliable and easier to use than the latter. In 1900 or 1901 Mr. A. J. Creagh, a former Tamworth solicitor, ordered a Thomson steam car from the Melbourne factory after reading reports of the Thomson steam car that was driven from Bathurst to Melbourne and its display at the Royal Easter Show in Sydney in 1900 and the Bathurst Agricultural Show. Although it appears that the reports were not satisfactory, Mr Creagh heard that improvements had been made and he received a favorable report from a friend in Melbourne. 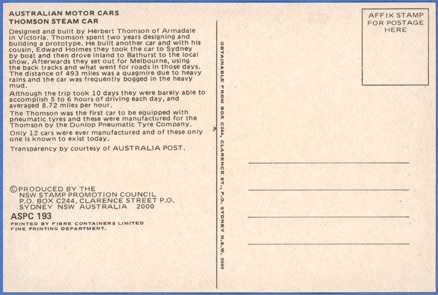 After a delay of several months beyond the promised delivery date, the Thomson steam car was shipped from Melbourne to Sydney and then on to Newcastle. It was arranged that the company representative would drive the car from Newcastle to Tamworth, picking up Mr. Creagh at Maitland. The journey was to take two days, a Saturday and Sunday, but by 2pm on the Sunday the car had only reached Muswellbrook. The Open Road (op. cit.) reported that the frame of the car and the engine were an exhibit "among the collection of historical relics gathered by Mr. H. H. Stevenson, and placed on view during the anniversary celebrations week at Tamworth." In The Open Road of 14/7/1938, p.2 it was reported that the engine was then in the possession of the NRMA and could be seen by those interested, in the basement of NRMA House. The engine was donated to the Museum by the NRMA in 1938. In The Open Road article published in the 14/7/1938 edition (p.2) Mr. W. A. W. Nicol , reporting a conversation he had had with Mr. A. J. Creagh, stated that he was "responsible for the design of the engine and boiler" having been asked by Mr. Holmes, the Company 'founder', to "prepare the necessary working drawings and designs." 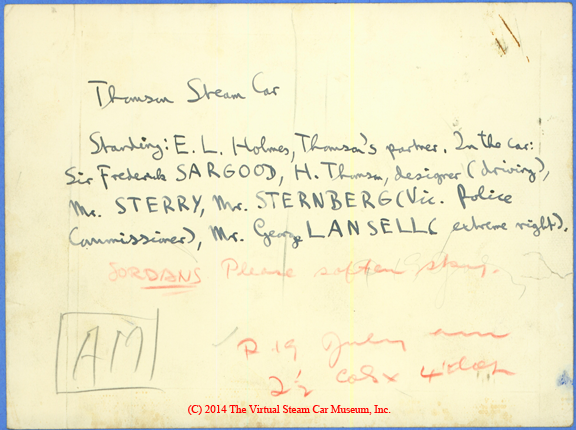 However, Mr. Thomson is stated to be the patentee of the engine and boiler. Considering Mr. Thomson's previous experience with the design and manufacture of an automotive steam engine for his 1898 car, which was run successfully in a long distance trial - Bathurst to Melbourne - it is probable that Thomson was the designer and Nicol the draftsman. See 95/260, Thomson drawings, for confirmation of Nicol as draftsman. Mr. Nicol describes the engine thus: "The engine was of such a design that the high-pressure and low-pressure cylinders were attached. Being of the inverted type the H P cylinder was on top of the L P cylinder and both were controlled by the one slide valve. Steam was admitted into the H P cylinder, and on the completion of the stroke was passed down through the slide valve into the L P cylinder. On completion of the L P stroke it entered the exhaust. There were two such engines in the unit." Mr. Creagh, in The Open Road article of 30/6/1938, p.5, described the engine thus: "The Thomson engine had two cylinders and was fitted with Joy's reversing gear instead of the ordinary slide valves. This information comes from the eBay description of the photograph, now preserved in VSCM's archive. The VSCM presents it as copied. More research and publication remains to be done.